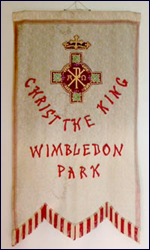 The Jesuit priests originally served Wimbledon Park from the Sacred Heart parish. With the development of the District Line railway, house building was undertaken at a very rapid rate and it was thought necessary to have a chapel-of-ease for the growing catholic population of the area. 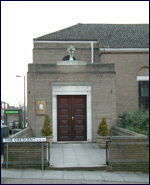 There were difficulties as the only land available without restrictions was near to the boundaries of the Sacred Heart Parish with Earlsfield. The Bishop foresaw difficulties and it was not until 1913 that Fr. O'Gorman was appointed to look after the Wimbledon Park District. At this point the outline of the Church known as St. Austin's was started but because of the restrictions placed by the Rector of Sacred Heart only one Sunday Mass was allowed. No societies were allowed to function or any service other than the one Sunday mass allowed. The original church was started but never completed and being covered by corrugated iron was referred to as the Tank. This was the situation until 1926 when the go-ahead to build the new church was given by the Jesuit superior and the Bishop. The present church was designed by Sir Gilbert Scott and was completed in 1928. The name of the church was changed to Christ the King, whom the Pope had recently established as a new feast, and it was officially opened on 7th October 1928. The hall remained as St. Austin's as it is today. The area continued to be a district of the Sacred Heart Parish until 1955 when Fr. Jordan was inducted as the first parish priest of Wimbledon Park. The break with the Jesuits came in 1959 when the parish was returned to the direct control of the Bishop. The Welcomers Group meets to discuss how newcomers to the parish are being welcomed and how to improve practices and facilities to ensure that all are made welcome at the parish. The group is comprised of several parishoners who meet on a regular basis with the parish priest. To contact any of the group administrators or leaders, please contact the Presbytery at 020 8946 2091 or wimbledonpark@rcaos.org.uk. The task force exists to provide a link between the parishes and the Deanery and the Diocese. It is in the process of promoting various projects in the Deanery, for example, adult confirmation and youth ministry. The parish has a child protection policy, which is available upon request. Please contact the Child Protection Representative, Maria Porter, on 020 8946 4132.